When you buy from Rebasco Decorators, you can be assured that you're getting a top quality product at the most reasonable price. We carry a wide assortment of today's finest carpet styles and colors to match any interior room decor, from sophisticated patterned berbers to the luxurious fine saxonies. Our professional sales staff can help you find the right carpet for any room in your home. We will make your job of finding the right carpet easier, more enjoyable and our service is unmatched! Special Note About Berbers: Berbers are really big bulky yarns that are either produced in a level loop, or multi-level loop carpet construction. Although many Berbers are made out of olefin fiber, some are made with nylon, or a blend of various carpet fibers. Nylon: This is the most popular synthetic carpet fiber used today. It offers tremendous value, performance, and ease of maintenance. Nylon provides brilliant colors and hides soil and traffic well. Olefin: This fiber is also called polypropylene, and is extremely popular in Berbers and level loops. 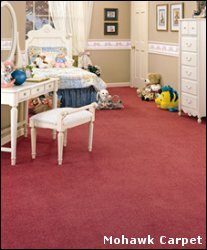 Olefin carpets are highly stain, static, mold, and mildew resistant. They can be used for indoor or outdoor carpets, including outdoor turf. Their resistance to matting and crushing are not as good as a nylon fiber. Polyester: Gives excellent color clarity with a soft feel to the carpet. Lacks the durability of a nylon carpet. Acrylic: Has a real wool look and appearance. Used mainly in level loops, bath mats, and some velvet carpet styles. Offers good mold and mildew resistance with low static levels. Wool: Although somewhat expensive wool still offers great bulk, performance, and an elegant look.